Rani Rudrama Devi ~ Amazing ..!! It happened only in our mother land India, where a woman has proved the world that what she is really capable of. The perception of the history of the past has often been primarily from male point of view.The activities of men are mostly projected while that of women were ignored and were almost neglected. Here I present the life of a Medieval Queen of Deccan, her Highness - Rani Rudrama Devi. Rani Rudrama Devi (1259 to 1289 AD) was one of the most prominent rulers of the Kakatiya dynasty on the Deccan Plateau, being one of the few ruling queens in Indian history. She shines gloriously in the medieval history of South India. She was the only child of King Ganapathi Dava who ruled at Warangal the capital of Kakateeya Dynasty that had sway over entire Telangana and most of the Andhra provinces during 13 th century. Kakatiyas of Warangal are one of the major dynasties that ruled over Andhra and shaped its history and civilization. The foundation of kakatiya empire was laid in land lying between Godavari and Krishan on a hillock called Hanumakonda. The Story of the builders of the empire goes back to the eight and ninth centuries of Christian Era. With Orugallu(now known as Warangal) as their capital the kaktiyas ruled over the Telugu country from about 1150 AD to 1323 AD. Rudrama Devi was born, as Rudramba, to King Ganapathideva (or Ganapatideva, or Ganapathi Devudu). As Ganapathideva had no sons, Rudramma was formally designated as a son through the ancient Putrika ceremony and given the male name of Rudradeva. Rudramadevi was married to Veerabhadra, Eastern Chalukyan prince of Nidadavolu. Ganapati Deva after taking advice from the illustrious Prime Minister Sivadevayya nominated Rudrama Devi as his successor in his last days. When she was only fourteen years old, Rani Rudramma Devi succeeded her father. In the first two or three years of her conjoint rule with her father, the kingdom was thrown into confusion and disorder due to Jatavarma Sundara Pandya, Invasion and the disastrous defeat of the Kakatiyas along with their allies on the battle. On the battle field of Muttukur near Nellore. Though Ganapati was ultimately successful in turning back the tide of invasion, yet he suffered loss of territory end prestige and his hold over his feudatories and nobles was shaken. Under these circumstances, he retired from active politics. So the real power vested with Rani Rudrama Devi. She used to look after all the administrative matters. From various inscriptions it seems that she started ruling independently from 1261. She lost both her husband and father in 1266-1267 and from a deep depression she changed herself for the sake of kingdom and finally she was coroneted in 1269 AD. A lady being made a king of vast Empire was no doubt resented by some nobles and her cousins who later raised banner of revolt. Even Veera Bhadra(Her Husband) also was jealous of Rudrmadevi ruling the land. She wore male attire and sat on the throne and with iron hand ruled the kingdom keeping the enemies at bay. 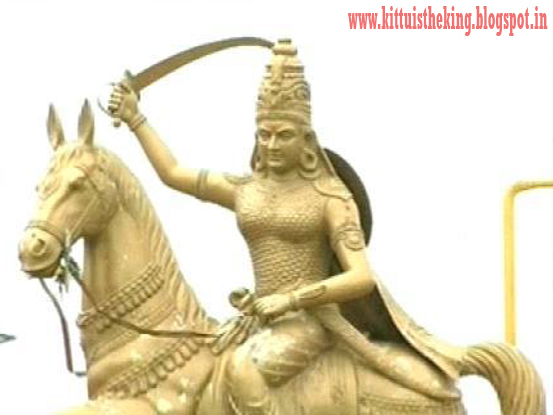 Pandyas and Cholas from the south Indian peninsula were also great threat and she kept them at bay with great vigour. After her accession she had to fight Harihara deva and Murarideva the cousins who revolted against the lady ruler. She had some efficient nobles like Jaganni deva and Gona Ganna reddy who helped her greatly in suppressing revolts. But the biggest threat came from the West in the form of Seuna Yadavas of Devagiri. Rudramadevi defeated Mahadeva Raja the Seuna Yadava Ruler of Devagiri ( Daulatabad in Aurangabad District at present in Maharashtra state)who invaded Warangal ( earlier known as Orugallu or Ekasilanagaramu) fort, the capital of Kakateeya empire and chased him away. Mahadeva was desirous to take the advantage of internal unrest in the kakateya Empire coupled by a Lady at the top. But little was known to him of her valor and administrative capabilities. She crossed Godavari chasing the yadava ruler right into his territories and forced him to make peace. The Devagiri King had to pay great amount of ransom to the queen and made peace. Although such treasures gained after victory belonged to the royal house she magnanimously she distributed the wealth among her troops most graciously. Rudramadevi faced a kayastha revolt from a king of her counsil Ambadeva. She could not tolerate the headstrong and disloyal Ambadeva. By that time Prataprudra her Grandson become old enough to share the responsibilities of the administration. He was of great valor and extraordinary war planner. He planned a three prong attack on the Ambadeva . The intention is to weaken all his support systems so that he don’t have enough strength. 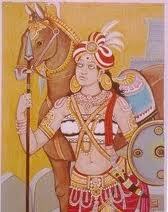 Of the three , the first was led by the Old Queen Rudrama Devi and her general Mallikarjuna. However, as the recently discovered Chandupatla (Nalgonda district) grant dated 1283 A.D. indicates, Ambadeva seems to have killed Rudrama along with Mallikarjuna Nayaka in battle in that year. However the Army of Rudrama Devi was victorious and later Prataparudra II, successor of Rudrama succeeded in completely suppressing the Kayastha revolt . Ambadeva was left with no shape and size to rethink of attacking Kakateeya Empire. Among Rani Rudramma Devi's accomplishments during her reign was the completion of Warangal Fort, begun by her father, in the Kakatiya capital of Warangal (one stone hill). Parts of the fort are still standing, including examples of distinctive Kakatiya sculpture. She worshipped goddesses. Bhadrakali, Ekaveera and Padmakshi. She captured important forts like Mulikinadu, Renadu, Eruva,Mutthapi nadu, Satti. Legend has it that due to her upbringing as a boy, Rani Rudrama was not much a connoisseur of music and art, but she was quite taken by a form of Shiva Tandavam - Perini which was extinct and it was brought back by Dr. Nataraja Ramakrishna. She found this dance more of an exercise to the soldiers and had it made part of the training of the royal force. After the death of Rudramadevi most probably in a battle, Prataparudradeva II ( 1296-1323) son of her daughter Mummadamma succeeded to the throne. In fact Ganapathideva announced Prataparudra as crown prince in his last days. The Muslim invasions on South India started during his reign and finally the Kakateeya Empire came to an end. Rudrama Devi was one of the most outstanding queens in Indian History from Kakateeya dynasty and people still cherish her memories. Her Gender did not come on her way in discharging the duties of her exalted office. She took an active part in governing the country and strove hard to promote the best interests of the state. In spite of the wars which frequently disturbed the country, her people remained contented and happy under her rule. She had also a deep moat dug around it Marcopolo. the Venetian traveller who paid a visit to the kingdom probably a little later, speaks highly of her administrative qualities, benign rule and greatness. She is one among the valiant and distinguished queens such as Durgavathi of Gondwana ( During Akbars times), Rani Chinnamma of Kittur ( During East India Company’s rule), of Maharashtra ( Aurangzebs times), Rani Laxmi Bai of Jhansi ( During East India Company’s rule), Razia sultana ( Early period of Sultanate at Delhi) and her memory is immortal..